101 $1 Store Meals: Saucy Meatball Spaghetti and Garlic Bread! 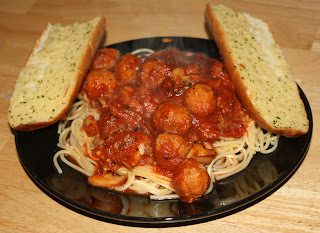 Saucy Meatball Spaghetti and Garlic Bread! There is nothing like sitting down to a plate full of noodles, sauce, tasty mushrooms and delicious meat balls. Unless, if you had a side of garlic bread to go along with it! This is a meal I have often. All the components can be found at a local Dollar Tree. While this dish might take a few more ingredients then some other meals here, it is well worth it! It is a hardy meal guaranteed to fill the stomach! Depending on how many you are serving, heat your water and cook your noodles. When your noodles are half way cooked, put your garlic bread in the oven and start your sauce. When all is done, server and enjoy! Yum! a 1-4 serving meal for only $6!